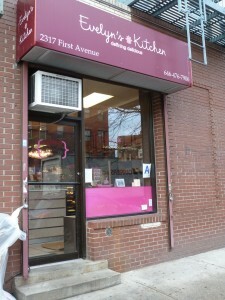 Evelyn’s Kitchen is very close to my apartment, so I have keeping an eye on the storefront for about two years. Originally set up as a wholesale and catering workspace, just recently the EK team transformed the tiny shop on 1st Ave into a retail storefront with an amazing assortment of baked goods, lunch/dinner specials, and a special order chef’s tasting table tailored to your every dinner desire. I dropped in one day looking for a sweet treat and found a smorgasbord of beautifully crafted, appetizing, and lovely packaged sweet and savory bakery items. Perfect for client meetings, parties, bridal/baby showers, or any other special occasion that needs you to bring a little sweetness (Thanksgiving, Anyone? ), Evelyn’s Kitchen has got you covered. When you walk into Evelyn’s Kitchen, though it is a small space bustling with activity, you feel an immediate sense of comfort and calm. While the social networking team pounds away on their keyboards tweeting photos of their latest bakery creations, the ladies behind the counter cheerfully take your order, their colleagues meticulously prepare gift boxes, and Ayala (EK’s Owner) pops her head out from the back to check in with everyone. Between their gift boxes, catering, and their (almost) too-beautiful-to-eat baked goods, I could tell that this team never lets any detail go overlooked. In fact, it seems like they have built their business and differentiated themselves by mastering all of the details. 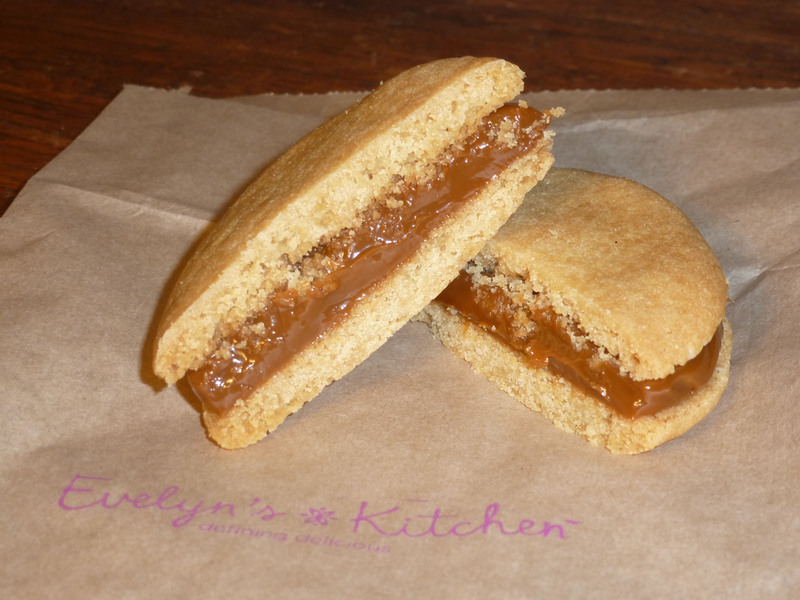 On my visit, I (went a little overboard) and got EK’s famous Toffee Blondie, a Rosemary Peppercorn Parmesan Scone, and a Salted Dulce de Leche Alfajor. 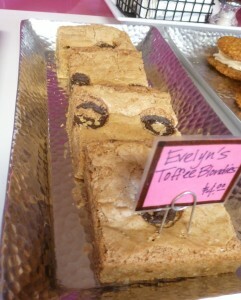 Because Blondies are what put Ayala, on the baking map, I had to try them. After one bite of this moist and wonderfully chewy Blondie bar I knew why the front door has a warning about the “dangerously delicious” treats inside. It’s true: the Blondies are lethal, and the Alfajor was a cookie sandwich masterpiece. Thick (but not sticky) and creamy dulce de leche is smushed between two crumbly and barely sweetened cookies and sprinkled with salt specks. Perfectly balanced, with just enough salt to emphasize the rich sweetness of the dulce de leche, these cookies have become my new addiction. 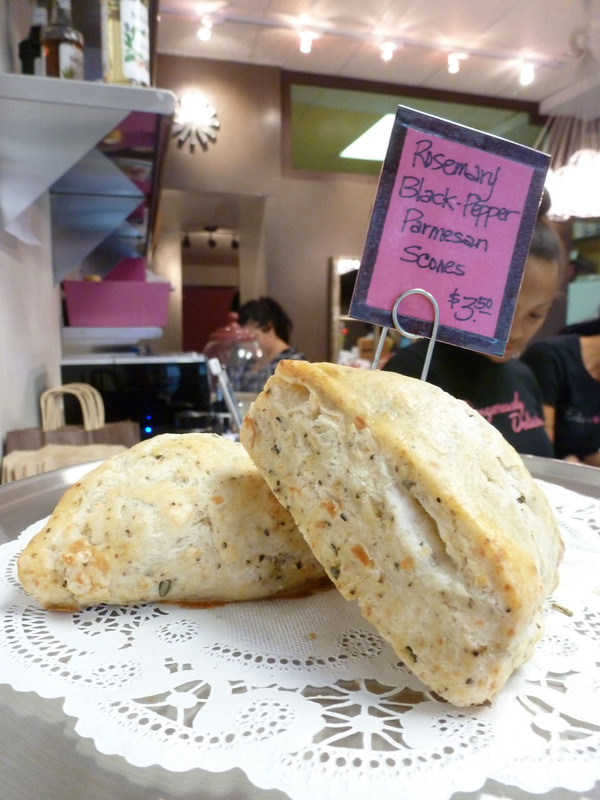 I had the Rosemary Peppercorn Parmesan Scone for breakfast the next day, and it was great. Unlike most scones, this savory triangle of flaky buttery goodness was moist and delicious even the day after it was baked. Each of the flavor components were prominent, but not over bearing, and the texture was lovely. 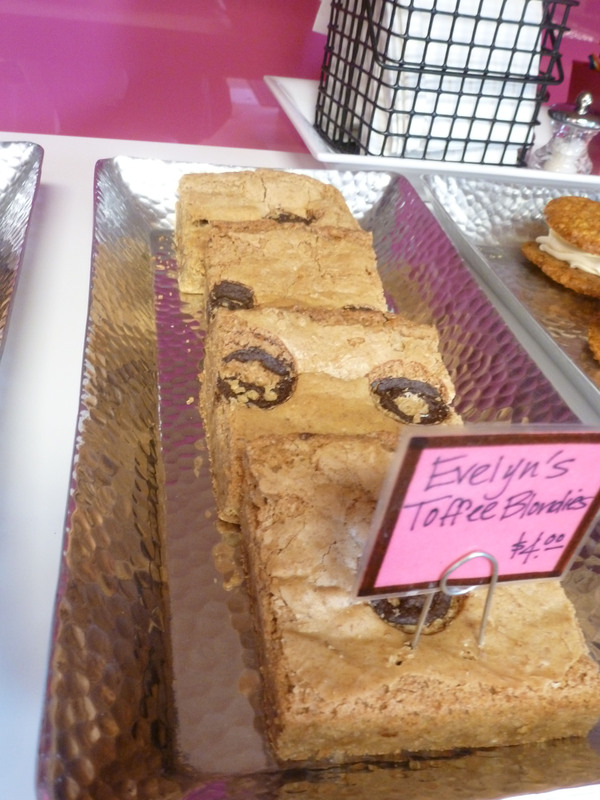 Though I only had a small sampling of their delightful pastries I’m pretty sure you could walk into Evelyn’s Kitchen with a blindfold on, point to anything, and you too could walk out with a new cookie addiction. For more information about Harlem Eateries and eating local in Harlem, visit Arionna’s blog, Harlem Food Local. 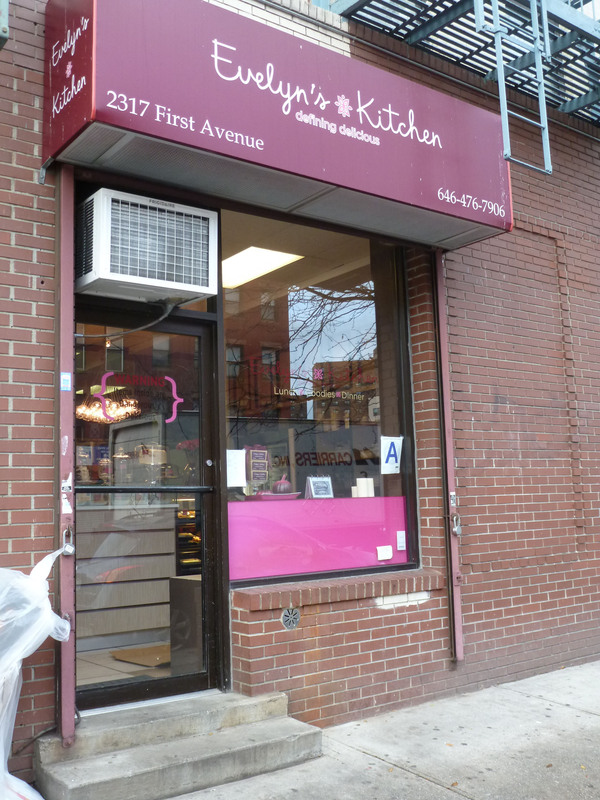 This entry was posted by Arionna on Thursday, November 15th, 2012 at 9:00 am	and is filed under American/Comfort, Bakery, Dessert, Harlem, Manhattan. You can follow any responses to this entry through the RSS 2.0 feed. You can leave a response, or trackback from your own site. An Uptown Eater seeking culinary imagination and exciting taste sensations, Arionna has eaten her way through the culinary revolution, transforming her neighborhood, into Manhattan’s hottest food destination, since she took up residence in Harlem eleven years ago. Determined to share all of her tasty and affordable Harlem food adventures, she has started her own blog, Harlem Food Local, to do just that. Check out her Harlem Eating Experiences every first and third Thursday of each Month on Cheap Eats for Happiness, $25 and under, above 96th St.